When I read about the opportunity to participate in On Kawara’s ongoing performance One Million Years as part of the North East’s AV Festival, I was immediately interested in signing up. The chance to participate in something that has been taken around the world with hundreds of people taking part seemed like a brilliant opportunity and as I read more about the artist and the work I was intrigued by its concept and simplicity. In short, One Million Years is a sculptural performance where two people (one male, one female) take it in turns to read dates spanning one million years. They read from hefty tomes Kawara has compiled of either past (998,031 BC – 1969 AD) or future (1996 AD – 1,001,995 AD) dates, the female reading the even numbers, the male reading the odd. The idea though simple becomes a reflection upon time. As the dates pass by so do the minutes and hours the pair spend reading and the time the viewer spends listening. Certain dates will resonate more than others, perhaps for religious, social or personal reasons, making each individual experience of either reading or listening to the work different. 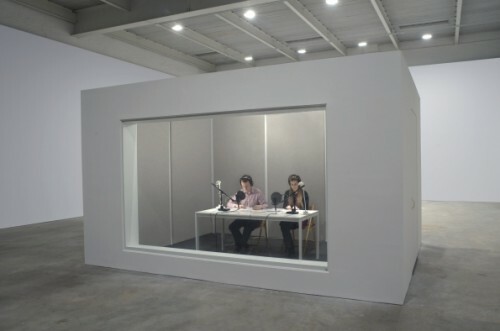 Kawara has been somewhat obsessed with time for much of his artistic practice. Born in Japan and residing in New York, his first time-centric work began in 1966 with his series of Today Paintings. For this series he simply painted the current alphanumeric date on a monochromatic background. He completed one of these works everyday and they are finished with an accompanying newspaper page from that day. There are now over two thousand of these paintings and they become time and event markers as well as encompassing themes of minimalist aesthetic, conceptualism and repetition. One Million Years follows a similar set of themes. It was first conceived in 1969 and the first reading was in 1993. A chance to participate in such a long running project seemed like too good an opportunity to miss. Despite my interest in the work, as the performance date crept up I began to worry. I’d weighed up the pros and cons of taking part with either a stranger or somebody I knew, and had chosen the latter. Even though I knew I’d be comfortable with the person sitting next to me I was still anxious…What if a pesky dry throat meant I coughed and spluttered my way through it? What if I lost my place in the vast listings of dates? And worse still, what if I started to get an urge to uncontrollably laugh? The more I thought about it, the more I began to worry about ‘doing it wrong’. The set-up at Baltic did nothing to settle my nerves. The exhibition space is beautiful, simplistic and minimal, with readers sat behind a stark white desk on a stark white stage. The two microphones, books of dates, a water jug, two cups and a timer are the only objects allowed in the sparse performance space. As a gallery assistant at Baltic I saw the very first sets of readers take to the stage and read the dates, women on the left, men on the right. I was surprised at the gentle tranquility of the space. Instead of finding the recitals jarring or boring they became an effortless part of the room. The readers themselves become as much a part of the work as the dates they recite. Their speed of reading, tone of voice and appearance just a few factors that add individuality to the systematic regularity of the dates they read. My performance slot for One Million Years was between 12.30 and 2pm on Wednesday 7th March 2012. It was a relatively quiet day in the galleries but still I had a case of pre-performance nerves mixed with quiet anticipation. I took my seat, poured myself some water (a good tip to do this before you start) and stared at the vast array of numbers neatly arranged on the page. The recording equipment was switched on and as 12.30 came round the readings started, male first. 916995 BC. Initially I was just concentrating on reading the numbers correctly and kept my eyes fixed on the page. I remember looking at the clock after five minutes and thinking…this is going to feel like forever. Next thing I knew, half an hour had past. We quickly got into a rhythm of alternating between us and found a tone, volume and speed that we were comfortable with. I started to look up from the page every now and again to observe the space. As people drifted in and out I wondered what they thought of the work, whether they found it interesting and if it meant anything to them. I found that as I relaxed I began to think of the numbers not just as dates but also as phone numbers or map references. I later found out that my partner imagined to be calling people up as he read. As I became immersed in the endless stream of figures I found myself in a weird limbo where in some respects I was constantly aware of time passing but in others I was totally oblivious to ‘real time’ and lost in the dates. The numbers on the page are split into paragraphed sections of hundreds. As we finished each paragraph and moved onto the next it felt significant. Time was slipping away as we read, years and years were passing by. When we turned the page it felt monumental. We had been reading dates with a prefix of nine hundred and sixteen thousand since the start of our session and as we neared the bottom of the page I could see that 915,999 BC wasn’t far away. It seemed imperative that we crossed to a new millennia of dates in the last section of our reading and the closer it got the more I felt a strange mix of anxiety and excitement. It really felt like we were counting down to something huge. When we reached 915,999 BC it felt like the end of an era. Gone were the 916,000 BCs – this was a new age. Our session finished soon after and we stepped down from the platform, slightly giddy, slightly glazed and with a sense of achievement. Our dates were from 916,995 BC to 915,984 BC. They did feel like ours. We had read for over a thousand years, and in line with Kawara’s own time marking practice, I will remember 7th March 2012 as the day I contributed ninety minutes to One Million Years. Thinking about the work I love that it is both incredibly slow and fast all at the same time. I love your summary of the themes in On Kawara’s practice but particularly your explanation of what it felt like to take part in. I am more than slightly envious that you have the confidence to take part. I doubt I could cope with the almost church like atmosphere and rather simple than expected (and therefore more exposed) staging. I’d find it particularly challenging to remain focused when the gallery visitors either circle the stage or move close to the readers and scrutinise them. I do love hearing the unique voices of the readers as they breathe life into ‘their’ body of dates. Which I’m sure like you the participants must feel some ownership of at the end of their 90 minutes. I also enjoy seeing the dynamics of the performative partnership developing between the two readers. Even when you know the other participant it can still result in something unexpected (or at least that’s what one of the readers shared with me) but when participants don’t know each other it does, at least to me, feel and sound more electric. I guess its that added element of the unknown. Finally I couldn’t help thinking of On Kawara when I saw this at Tate…	Alighiero Boetti’s 11 second light can’t recall or find online its ‘proper’ title; Also Matthew Collins ‘Beautiful Equations’ on BBC 4. Thanks Elizabeth, that’s a lovely response. I find it really interesting to hear other people’s opinions on the work both from the point of view of reading and working with it, I will be sure to look into Alighiero Boetti and Matthew Collins too.